After a long time, electric cars are becoming popular once again these days, particularly due to ever increasing prices of diesel and gasoline. Electric cars have several distinct advantages over gasoline-powered vehicles. Firstly, after initial investment, there is absolutely no recurring expenses on fuel; resulting in considerable savings. Electric car motors are practically noise-free unlike internal combustion engines of gasoline-run cars. You can enjoy the same high-speed drive as in standard gasoline vehicles. There will be considerable savings in terms of time and costs; there is no need to stop an electric car on a long drive from time to time for filling up gas. Apart from all these factors, electric cars do not emit any harmful gases and therefore, are pollution-free and environmentally friendly. It is a very simple procedure to convert the existing conventional internal combustion engine car into an electric car. There are also many companies selling full-fledged electric cars. Those who would not like to take the trouble of converting their cars into electrical ones on their own and get their hands dirty or greasy; they can dispose off their cars and buy an electric car from a car dealer. There are also many companies, such as Canadian Electric Vehicles that sell electric car conversion kits for the benefit of those who would like to fit electrical system in their cars without any external help. 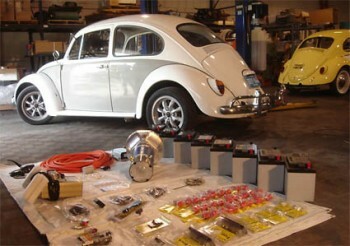 There are two types of electric car conversion kits, the universal kit and the custom-made kit. The universal kit, similar to the ones made by the Canadian Electric Vehicles and the Deluxe Universal Kit produced by the Electro Automotive are meant for varieties of light vehicles, such as cars and small trucks. The kit includes all components and accessories required for conversion such as the advance DC motor, Adaptor, Contractor, Controller, Pot Box, Circuit breaker, Fusible Links, Ampere and Voltage Gauge, Shunt, Charger, Cables and the Batteries. In contrast, the custom-made kits are made exclusively for a particular type of vehicle and thus are not suitable for any other type. For example, the electric car kits are available specifically for Sentra, Beetle, Ford Rangers, Fiero and Civic or Rabbit cars There are a few vehicles that have different configurations as compared to other cars or trucks. Custom-made kits and specific equipment are necessary for these models in order to convert their engines to run on electric power, as for example the total ‘drive system’, battery racks and boxes. Apart from knowing about the various types of kits required for conversion of standard cars into electric car, it is necessary to be familiar with different guidelines for conversion of internal combustion engine into an electrical system. Before taking up the conversion job, it is essential to make sure that there is adequate space in the car to keep the batteries and for providing sufficient ventilation. It is also important to check whether appropriate kit has been purchased and that it has all the needed tools. After installing, it is advisable to ensure that all the components are accurately connected. It is also necessary not to drive on bumpy roads to avoid damages to various components of the engine. One should recharge the battery whenever necessary and according to experts, the battery should be replaced at least by three years. In order to get comprehensive guidelines on installing an electrical system in the existing car, it is better to purchase an online guide that gives the details of the procedure for conversion of the traditional car to an electric vehicle. This will facilitate in familiarizing with the various components required and the instructions to connect them correctly.